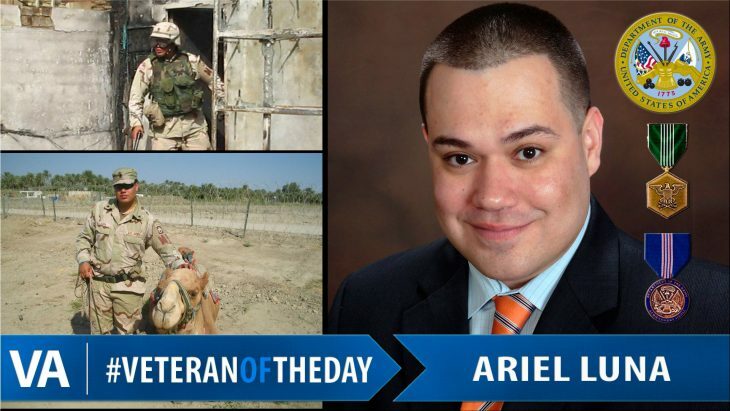 Today’s #VeteranOfTheDay is Army Veteran Ariel “AJ” Luna. AJ served from 2000 to 2006. AJ enlisted in the Army in 2000 and began as a communications soldier at Fort Gordon, Georgia. In 2002, he joined the New York National Guard where he was deployed in support of Operation Iraqi Freedom in 2004 with the 95th MP Battalion. While serving in the National Guard, AJ pursued his bachelor’s degree in Television and Radio at Brooklyn College. He also completed his Masters in Administrative Science with a concentration in Non-Profit Organizational Development from Fairleigh Dickinson University. In 2009, AJ became the director of Veteran services for Fairleigh Dickinson University. The Office of Veteran Services was created to provide student Veterans with access to a variety of services. Soon after, AJ was appointed Director of Veteran Services for Bergen County, New Jersey. He focused his efforts on housing, employment opportunities and service referral providers. In August 2016, the County of Bergen became the 28th community in the United States to have “effectively ended veteran homelessness”. Thank you for your service, AJ!